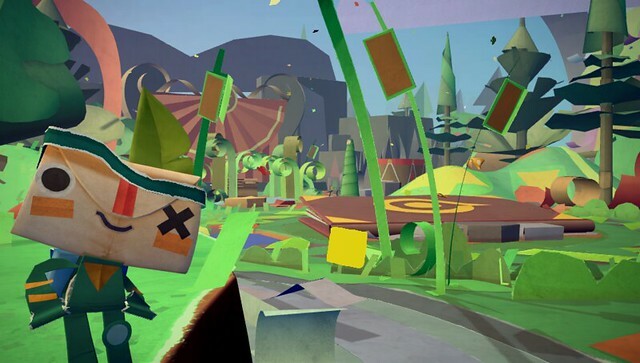 Tearaway is kind of like a buddy movie. It stars iota, a messenger from a paper dimension, whose envelope head contains an urgent message to deliver… to you! It’s a very special message, and one that’s unique for each and every player. In order to read yours, you’ll need to take up the role of co-star and, together with iota, journey through the vibrant papery landscape — two buddies going on an epic adventure. You and iota will travel afar, taking on enemies and helping those in need. You’ll conquer adversity and discover magical papery surprises. 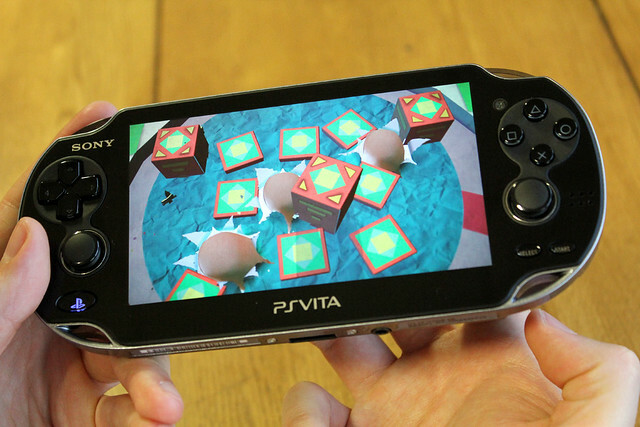 But in Tearaway, you’re holding more than just a PS Vita in your hands — you’re holding the paper world itself! Using the god-like powers inherent to someone who can hold an entire world in their giant hands, you can make your presence felt using a wide range of godly powers that take advantage of all the PS Vita’s bells and whistles — some subtle and some epic. You can shake things up or turn them upside down. A gentle breath from you is a gusty storm. You can even poke your fingers into the back of the PS Vita to tear through into the world and help iota complete this very special delivery. 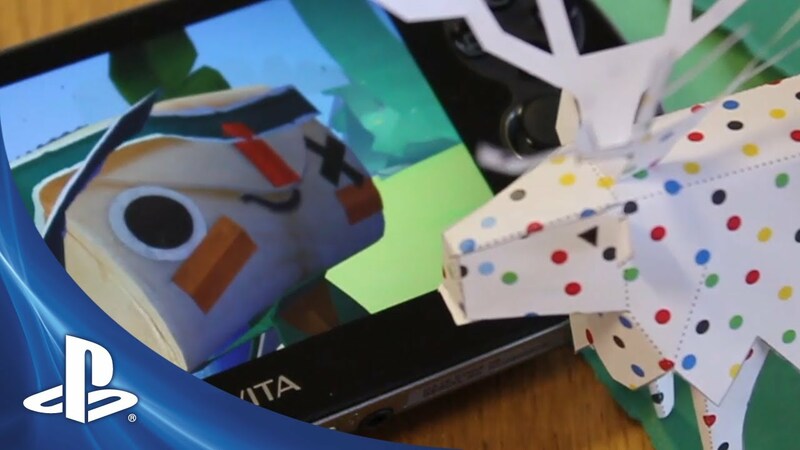 Anything you see in Tearaway’s papercraft world can be created in the real world from bits of paper! See for yourself — head on over to our Facebook page to get the plans to make your very own customizable Tearaway Papercraft Elk. Be sure to visit us on Twitter too, and show us your creations! For anything else, you can check out Tearaway’s official site. This is a very interesting title. I loved me some LBP, but this looks liks some reall good combinations of touch controls and platforming. I hope the price is righ, I’m very interested with this one. I think I need to buy a vita. Oh Media Molecule, I seriously don’t know how ya’ll brain works but you guys are just mad geniuses. I think this is sort of a ‘filler project’ for them. Their next BIG thing is obviously going to be a ps3/4 game. I’m not saying that this game won’t be any good, or that I’m not buying it- because I am and it will be. If it’s a full length game it will cost $39.99. You cannot expect anything less from a Triple-A studio. Media Molecule is the only company keeping the Vita alive. I don’t own a Vita, and never had any interest in a handheld gaming device, but this game really makes me rethink that. looklike another “childish” game. Look great but i’ll pass. LBP was too “childish” for me. @10: Enjoy waiting forever. See you a week from never. The design of the game wouldn’t even work on the PS3. @12: the only childish thing here is your attitude. What are you early teens? God I hope so, because there’s no reason an adult shouldn’t be passed that frame of mind already. It’s… goddamn brilliant. Typical MediaMolecule. I’ve seen enought to know that I’ll be buying this for sure. HEY GREAT PICS! I REALLY LOVE IT! CANT WAIT 4 THIS GAME! ANTHOER GAME FOR MY VITA! HEY ANY WORD ON A RELEASE DATE OR PRICE? NEED TO KNOW THANKS! Very very cool looking! Lots of great ideas there! Can’t wait to see more!! It looks incredibly innovative and has a great art style. I’m curious if there will be a “public” mode or something so everyone’s not yelling at their Vitas on the bus. WOW THEY MADE FUN INTO A GAME! Until now, I was getting tired of not having Vita games to play, but this looks really promising! I think this is just the kind of game the Vita needs to really take off! Too cool. Love the art style. You can tell this is from Media Molecule. Poor Alex was getting choked up on stage. Looks like you guys have worked very hard on this. And what was this about Playstation not showing the Vita any love? There were more vita announcements today than I could handle with hopefully more coming soon. Anyway, this game looks really…interesting. But it’s from media molecule so I know they won’t disappoint. The game looks brilliant. Also, kudos to whoever is picking the songs you guys use in the trailers. LBP has a fantastic soundtrack so I look forward “hearing” more about tearaway. @SalM …..you forget about games like the Souls game that inafune’s working on and Gravity Rush/Daze? I let my son watch the video, guess what…you guys just cost me more money, now I HAVE TO buy a copy or I’ll never hear the end of it. Combining, fun, simplistic looking gameplay into a cute world…how could you. Now my lil guy is going on and on about how he can roar into the mic on his Vita to make the little guy roar to blow away the bad guys and how he can use his fingers to swat them away and stuff, you guys just dont know when to quit. Signed, Broke Parent & Happy Gamer. Not interested in blowing on, or yelling at my game hardware. Stealing Sheep getting some mad love. I approve. Definitely picking this up. If by childish you mean creative and innovative then yes, this game is very childish. I don’t mind the blowing as much as the yelling. I’m a very meek individual so I hope you provide us a walk-a-round. Is this a full retail game? Also, release date? Unique gaming experience. I will buy this. As for the many people who whine about “new games, not ports” for Vita, here’s one so buy it. This looks just as fun and original as LBP did when it first arrived on the scene. MM, you are all incredible! This is a must have on Vita! I can’t wait! This game looks fun. I got my vita and was a little board with it at first disappointed they didn’t use all the fun features this game looks like it will take things to the next level. I’m a big LBP fan MM has some very creative stuff and this is something I would expect from them excellent. Now I want a PS Vita more. Consider it eventually bought. Very impressive! The game looks great, and seems to be appropriately suited to the hardware as well. Media Molecule is surely one of the brightest gems in Sony’s crown. Keep up the good work! Awesome trailer! Pre-order without a doubt. But, just 1 question…what is that song? It is absolutely perfect for your game and the trailer (of course, that’s just how you guys roll). Is Play Create Share apart of this game? ok, i think mm has a portal to the world of small, adorable, human shaped characters cuz they keep whippin em out. and can anyone else forsee some lbp dlc, lol. imma have to get this, mm has never let me down. MM have to be one of the most creative studios i have ever seen in gaming, very smart decision sony made when they added them to the playstation family, people were complaining that sony doesnt let its big studios develop games for handheld systems, well there you have it guys, MM and GG are developing Tearaway and Killzone Mercenary. consider 2 copies of Tearaway bought day 1 MM. i cant freaking wait to see how you guys are gonna take advantage of Near, is Tearaway supporting Play, Create, Share? Wow, that was amazing. 1st day buy.